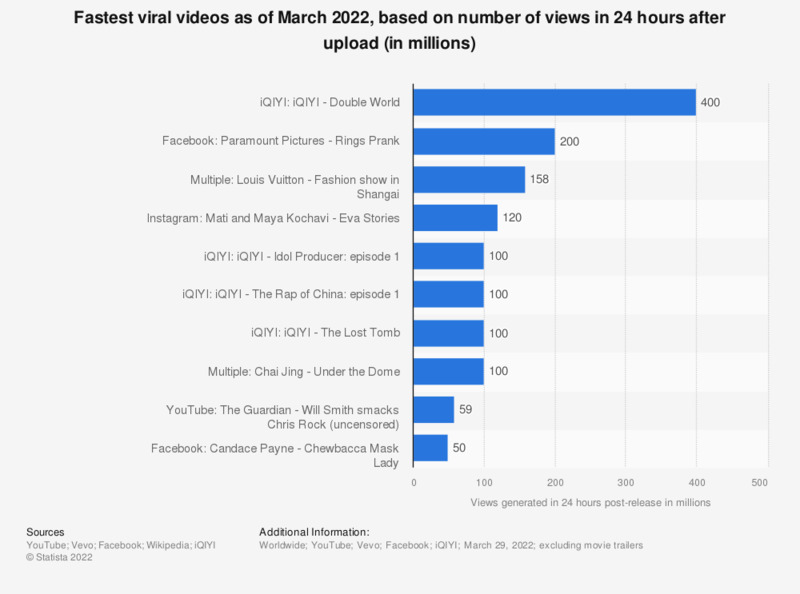 In April 2019, South Korean boy band BTS broke the record for the fastest viral music video by generating 74.6 million views within 24 hours, with their new music video "Boy with Luv”. The seven-member band handily crushed fellow Korean pop quartet Blackpink’s barely week-old record of 56.7 million views. The overall top-ranking video based on view count in the first 24 hours was a Facebook prank video based on the horror film "Rings" (2017). Music videos are among the most popular content on YouTube. Currently, the most popular YouTube video based on lifetime views is “Despacito ft. Daddy Yankee” by Luis Fonsi. Nine of the top ten most-viewed videos are music videos. Music audiences are highly engaged and since 2010, all the most-viewed videos on YouTube have been music videos, with Lady Gaga, Justin Bieber, PSY, and Wiz Khalifa successively claiming the title before ceding it to Fonsi. Korean pop (K-pop) artists are currently making a splash on YouTube. Since the mid-2000s, K-pop has been a significant player in the East Asian music market, but it was not until PSY’s colorful and catchy “Gangnam Style” in 2012 that Korean music videos went truly mainstream in the Western music industry. Aside from BTS, other K-pop artists on the ranking of the fastest viral videos include Blackpink, PSY, and Twice. Grey color = Indicates the video is not a music video; originates from either Facebook or YouTube. Women: Do you seek out viral videos online on parenting? Women: Do you seek out viral videos on wellness/health/fitness online?